The Shot Nurse Immunization and Wellness Service was established in 1995 by Kimberly Cole Gray, RN, BSN who saw the need for providing fast & convenient immunization and wellness services to the community. Today, The Shot Nurse serves businesses, churches, schools and individuals for all of their immunization and wellness needs. Because of our nurse specialists’ expertise and superior service, The Shot Nurse is now the #1 provider of vaccination services in the Mid-South. Our management team of talented professionals includes Deborah Overall, RN who, in 2002, became Chief Financial Officer. First joining the team in 2005, Laurie Rich, RN, became Nurse Manager and General Manager overseeing the staff of our walk-in locations and outcall service in January of 2010. Joining the team in 2015, Ashley McGrath, LPN is the office manager of the Poplar branch. Beginning as a staff nurse Melinda Sample, RN is now manager of our Testosterone Replacement Program as well as the Office Manager for our Cordova location. Marianne Wilson, RN joined the team full time as Office Manager of the Saddle Creek, Germantown location in 2015. At 3 convenient locations with front door parking and no waiting, The Shot Nurse’s team of specialists provides services that prevent disease and improve one's quality of life. 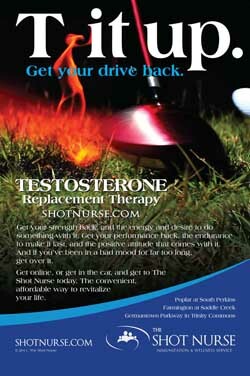 With no appointment necessary, The Shot Nurse has the protection you need with a personal touch! For groups of 10 or more, The Shot Nurse can come to you! Our goal is to provide nursing services to companies that do not require or have the resources to employ a full-time nurse. We also proudly serve civic groups, schools, colleges, travel agencies, government agencies and churches. These services include immunizations, wellness programs, blood testing, monthly Vitamin B12 shots, Tb skin testing and on-site drug screenings with instant results. Whether a company has ten employees or several thousand, The Shot Nurse is dedicated to providing the highest quality nursing services to businesses and individuals in the Mid-South area. For clients who choose to improve the health and wellness of their employees year-round, we offer a Wellness Program tailored to suit their needs. We want to be your "personal nurse." This unique approach to wellness is unmatched by any other provider anywhere in the U.S. The Newest Shingles vaccine, Shingrix is available at our offices. Supplies are limited and may run out due to demand so availability is not guaranteed. Click here for more information about the vaccine. The 2018-2019 Flu Vaccines IS NOW AVAILABLE. We also have HIGH-DOSE and FLUAD FLU VACCINATIONS FOR THOSE 65 AND OLDER. Flumist is back and available this season. Burn Fat. . . Get Energized with our weekly LIPO SHOT!. ENERGIZE YOURSELF WITH A SHOT OF B12. We NOW offer bi-weekly (every 14 days) injections of VITAMIN B12. The cost is $20 per shot with every 5th SHOT FREE! Travel vaccines are in high demand as mission groups, vacationing families, research teams, student groups and individuals plan travel outside of the United States. Travel Vaccinations are The Shot Nurse’s specialty! Our specialists will consult with you about what is needed for your trip abroad including the hard to find yellow fever vaccine with documentation. You’ll even receive a complimentary prescription for Malaria medication during your trip! Click here to view our extensive travel vaccination page. Yellow fever vaccine is available at our Poplar office only. Please call for details.